Whether you're new to the business or are a seasoned marketer, you need to present product information in a concise but interesting way. This is where metallic sales sheet printing comes in. When done right, a sales sheet, or sell sheet as it is sometimes called, can get your product noticed in a competitive marketplace. It can help build awareness and persuade people to buy your product. Stand out with a great product shot. This is the first thing that your customer is likely to notice, so invest in a high-quality photo. Be clear about the benefits. What problem are you solving for your customers? Make sure the benefits are prominently listed in your sales sheet. Design it for skimmers. Use bullet points and lots of white space. Add social proof. Whether it’s a certification or customer testimonial, an element of social proof helps boost people's trust. End with a clear call-to-action. Make your CTA easy to follow like a link to a landing page or a phone number. A well-designed sales sheet can work wonders in getting more customers and closing deals. To get the most out of your product sales sheets, choose the metallic ones. These sheets provide shimmer that highlights all the important information and adds to the perceived value of your product. 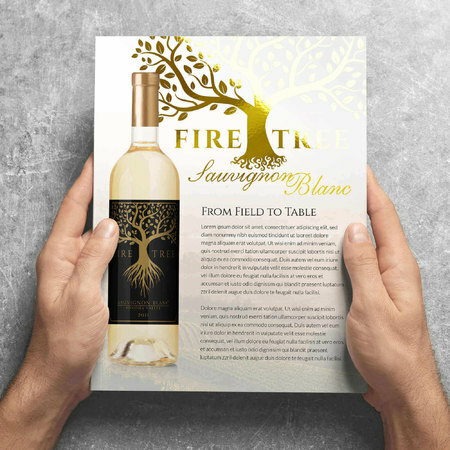 Metallic sales sheets allow you to create gradients through foil stamping. The result is a dazzling design that will surely capture your customers' attention. The optional spot UV coating can enhance the beauty of your artwork. It offers the best contrast against dark colors. How is a sales sheet different from a brochure? A sales sheet usually focuses on one or two product features or benefits, which are sometimes technical in nature. A brochure contains general information and may contain information about different products. How thick is a 16 pt. cardstock? It is half the thickness of a credit card, which is equivalent to a 32 pt. cardstock. Do you have any legal size option? The largest size we offer is 8.5" x 11", which is letter size. Can I have my marketing sales sheet printed fast? Our standard printing time for metallic sales sheets is 6 business days due to the extra printing time for the metallic layers. Are metallic sales sheets printable on both sides? Yes, you will see this option on the calculator on this page.